The Olympics are over and I’m left with the same ambiguous emotions I’ve had since being in Olympia, Greece for the lighting of the flame. The Olympics are over and I’m left with the same ambiguous emotions I’ve had since being in Olympia, Greece, for the lighting of the flame that multiple runners carried around the world. I sat in that ancient stadium and heard the leaders of Greece and China speak in their native languages while their national flags rose behind them. Jacques Rogge, Chairman of the International Olympic Committee, spoke in English, even though he is from Belgium. The Olympia flag rose. I watched the first runner sprint across the ancient tract. What a thrill! Only one incident gave me pause. During the speech by the head of China’s Communist Party and Chairman of the Olympics in Beijing, one sole protester held up a FREE TIBET sign. He was quickly whisked away and the program continued. As the torch made it’s way around the world, huge protests and demonstrations against China’s poor human rights record, cruelty against Tibetan monks, and China’s support of the oppressive regime of President al-Bashir’s in Sudan followed. Therein lies my dilemma. China put on a spectacular show. The athletic events were riveting. The documentaries about the Great Wall and the Forbidden City mixed with modern restaurants and foot rubs were highly entertaining. But I also knew about the torture of political prisoners, the lack of even minimal freedoms, extreme poverty, etc. lurking behind the grand façade. How does one process these extremes and reconcile these two realities? Two individuals still stand out in my mind. 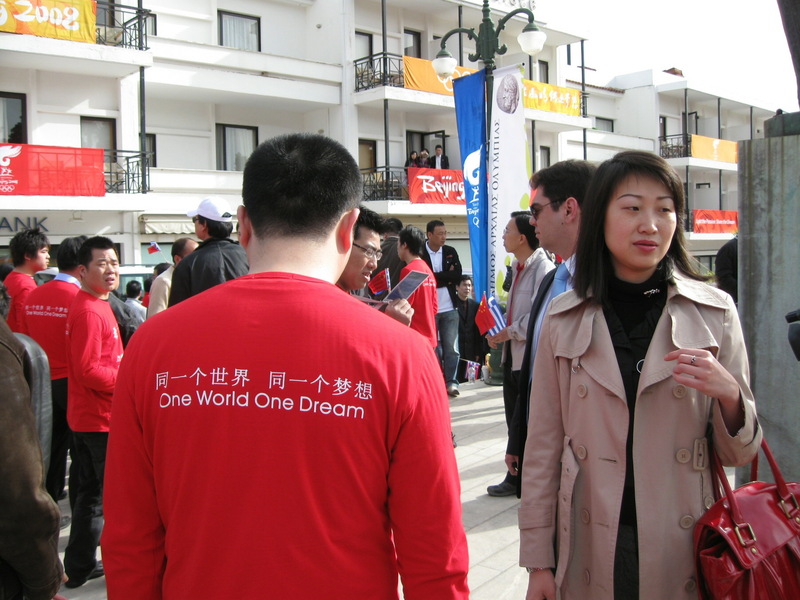 One, a Chinese young man, wearing the red “One World, One Dream” tee-shirt. 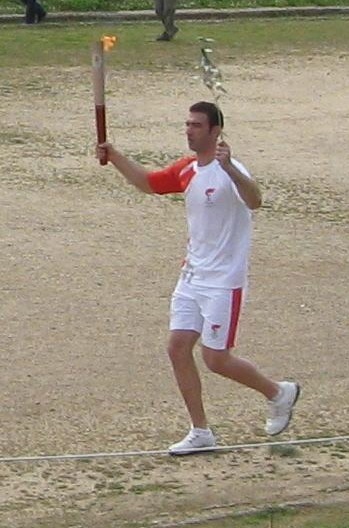 He was with a large group of similarly-attired young people (athletes?) in front of the Press Office in Olympia on March 25, for the flame lighting. An equal number of Greek young people faced them in their blue and white tee-shirts with the message printed in Greek. Both groups held small flags of both countries. I watched the two groups come together, shaking hands or hugging. Words were not necessary. Harmony personified. I wrapped my arm around this young Chinese and my friend took our picture. I won’t publish it, but here’s the back of the tee-shirt. He then took a picture of the two of us. We smiled at each other and parted. The other individual I saw only on TV: Lopez Lomong—a member of the U.S. Olympic team and now a U.S. citizen—carrying the American flag in the opening ceremony in Beijing. As one of the Lost Boys of Sudan he is president and co-founder of a different sort of team: Team Darfur. The organization is an international coalition of athletes committed to raising awareness about and bringing an end to the genocide in Darfur, Sudan. Lopez Lomong has learned to reconcile these two realities about China.